While former Braves/Orioles general manager Frank Wren, currently the Red Sox’ senior vice president of baseball operations, had previously been tabbed as a leading candidate for the GM vacancy in Boston, Ken Rosenthal of FOX Sports reports that Wren is now “unlikely” to become the team’s next general manager (Twitter link). Wren, as WEEI’s Rob Bradford recently pointed out, resides in Atlanta and wasn’t a guarantee to accept a greater role with the Sox even if the team wanted to promote him. Per Rosenthal, Wren is happy with his current position within Boston’s front office. The Sox, of course, are in the market for a new GM after Mike Hazen was hired as the new GM of the Diamondbacks. President of baseball operations Dave Dombrowski said yesterday that the ideal scenario for the Sox would be to fill the GM void internally. That leaves a fair number of options, but MLB Network’s Peter Gammons reported earlier today (via Twitter) that the question among GM circles is whether Red Sox vice president of amateur/international scouting Amiel Sawdaye would take the “diminished” GM role in Boston. Certainly, even though Sawdaye would be second in command as opposed to the top decision-maker, it would seem logical that Sawdaye would welcome the promotion. And indeed, the Boston Herald’s Evan Drellich tweets that the likely removal of Wren’s name from the running now places Sawdaye in the spotlight. Also of note with regard to the Boston front office is Gammons’ report that analytics director Tom Tippett has left the team. Drellich reports that Tippett, who spent the 2008-13 seasons as the team’s director of information services before rising to the role of senior baseball analyst, was offered the opportunity to return but elected to pursue other avenues. Tippett told the Herald’s Michael Silverman that he could end up working for another club or within baseball in another capacity, adding: “…but I’m also interested in other spots and opportunities outside the sports world.” Peter Abraham of the Boston Globe tweets that Dombrowski said Tippett’s role will be filled, though he declined to specify if it’d be an external or internal hire and added that the position’s title is to be determined. Those interested in the inner-workings of the Red Sox’ front office under current and prior leadership groups will want to check out Drellich’s above-linked column, as he quotes Tippett in discussing the leadership styles and strengths of Dombrowski as well as former Boston GMs Ben Cherington and Theo Epstein. Notably, Drellich reads between the lines a bit and wonders how heavily Tippett was leaned upon by Dombrowski, as Tippett said back in August when speaking at a seminar entitled Sabermetrics, Scouting and the Science of Baseball that Dombrowki has a “smaller inner circle that he works with when he’s making decisions” than either Epstein or Cherington did. 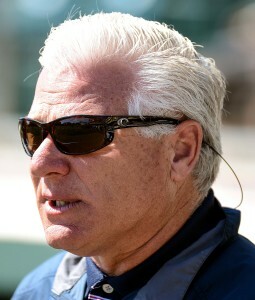 The Red Sox announced this afternoon that former Braves GM Frank Wren has been hired as the team’s senior vice president of baseball operations. Wren, 57, worked with president of baseball operations Dave Dombrowski previously in the Marlins and Expos organizations. He will add to the team’s new-look front office, which also features newly appointed general manager Mike Hazen, who was promoted yesterday after previously serving as the team’s assistant GM. Boston also announced that assistant director of player personnel Jared Banner has been promoted to director of player personnel. Wren was rumored to be a candidate to step in as the new Red Sox general manager immediately upon Dombrowski’s hiring, although Jon Heyman of CBS Sports reported last week that he may ultimately sign on with a title other than GM. That appears to be the case, though based on Wren’s title, one can imagine him playing a significant role in baseball operations decision-making. Per the press release announcing the move, Wren“will serve as a talent evaluator and will assist Dombrowski in all aspects of baseball operations.” Based on that description, Wren will report directly to Dombrowski, though he’ll still be underneath Hazen in terms of organizational hierarchy. As Brian MacPherson of the Providence Journal tweets, it seems that Wren will be an aide but, unlike Hazen, won’t handle negotiations with agents or other teams. Nevertheless, the late missteps in Wren’s tenure outweighed the successes in the eyes of ownership, who replaced him with fellow veteran baseball ops exec John Hart. His new role with the Red Sox will be more limited, it seems, as he’ll serve primarily as a talent evaluator and will be based in Atlanta as opposed to in Boston, according to Peter Abraham of the Boston Globe and Sean McAdam of Comcast Sportsnet New England (Twitter links). Former Braves GM Frank Wren might be the front-runner for the Red Sox’ open GM position, but ESPN Boston’s Gordon Edes looks at other potential candidates for the job now that the Sox have hired Dave Dombrowski to be their president of baseball operations. Given the Sox organization’s strong interest in analytics, some of Edes’ potential candidates, like former Cubs GM Jim Hendry and former Dodgers exec Ned Colletti, seem to me to be somewhat unlikely. Edes notes that Hendry worked with Dombrowski in the Marlins organization, however, and that past ties often help determine who gets hired. Here’s more on the Red Sox. Tim Britton of the Providence Journal looks at Dombrowski’s five best trades as GM of the Tigers and Marlins. Dombrowski’s 2007 acquisition of Miguel Cabrera and Dontrelle Willis for a package headed by Andrew Miller and Cameron Maybin unsurprisingly tops the list, which also includes his less-remembered but still very helpful deals for Carlos Guillen and Placido Polanco in Detroit and for Mike Lowell in Florida. Clay Buchholz, currently on the 60-day DL with a right elbow strain, is not currently throwing, Tom Layman of the Boston Herald writes. “He feels good enough to throw, but we are evaluating him daily to see where he’s at,” says interim manager Torey Lovullo, who adds that Buchholz has not had a setback. Lovullo says the Red Sox haven’t determined that Buchholz will be shut down for the season. It seemingly wouldn’t be surprising if he didn’t pitch again this season, however. There’s only a bit more than a month left, it takes time to be able to pitch enough innings to start, and the Red Sox are out of the playoff race. Following a 45-minute introductory press conference for new Red Sox president of baseball operations Dave Dombrowski, Scott Lauber of the Boston Herald provided a rundown with some highlights. Dombrowski was blunt in stating that the Red Sox need to find some pitching, specifically stating his affinity for power arms. He also noted that a top-of-the-rotation arm is something he’d prefer to bring into to the fold. “Normally, if you’re going to have a world championship club, you need to have a No. 1 type of guy,” Dombrowski explained. He also addressed the team’s GM search. When asked about why he needs a general manager, when it’ll be Dombrowski who has the final say, the veteran executive replied, “This is a big market. There’s a lot going on, day in and day out. We have a lot of expenditure at the major-league level, pursue talent aggressively all over the globe. I think if you get the right person on board with you, if you can get that person and be in sync with them, that can only be helpful.” Dombrowski also touched on his familiarity with analytics as well as the fact that he doesn’t necessarily feel the need to make sweeping changes to a front office that already has “a lot of good people” with “good reputation. After speaking with multiple industry sources, Sean McAdam of CSN New England writes that four candidates for the Red Sox’ GM opening include former Braves GM Frank Wren, former Rockies GM Dan O’Dowd, former Angels GM/current Red Sox advisor Jerry Dipoto and Yankees assistant GM Billy Eppler. Wren has been oft-mentioned in the past few days, and O’Dowd has also popped up more recently in reports. Regarding Eppler, McAdam writes that he’s blocked in New York by Brian Cashman, and many expect him to land a GM job elsewhere this winter. Ken Rosenthal of FOX Sports spoke to one rival executive who said he would be “shocked” if the Dombrowski hired anyone other than Wren to serve as his new general manager (Twitter link). Of course, in the above-linked piece from Lauber, he writes that Dombrowski is in the early stages of compiling a list of candidates, and the Sox have assured the commissioner’s office that they’ll be interviewing minority candidates in their search. ESPN’s Jerry Crasnick reports (Twitter links) that there’s some industry buzz that Dipoto is on the Brewers’ radar as they look for a new GM. Milwaukee is said to be looking for a younger, more analytical general manager following Doug Melvin’s announcement that he’ll transition to an advisory role. Crasnick also notes that there’s some speculation that Cherington would be a good fit for Milwaukee’s GM vacancy. The Red Sox’ stunning announcement that Dave Dombrowski will take over as president of baseball operations is still sinking in for many, but further changes figure to be on the way in Boston. Anthony Fenech of the Detroit Press spoke to Dombrowski and tweets that the new Boston president believes he will hire a GM to work underneath him (Twitter link). Bob Nightengale of USA Today Sports tweets that former Braves GM Frank Wren, who worked with Dombrowski in the Marlins and Expos front offices in the 1980s and 1990s, is a leading candidate for the position. Wren’s more traditional background of scouting would seemingly align well with Dombrowski’s strengths, as opposed to a more analytical GM like Ben Cherington, who passed on the opportunity to remain on board as the Red Sox’ GM following the addition of Dombrowski. There’s been speculation about Jerry Dipoto, who is working with the Sox on a temporary basis at the moment, but he, too, has a more analytical slant and wasn’t hired by Dombrowski. Wren was fired by the Braves last September, with John Hart taking over as president of baseball operations. (Notably, the Braves serve as an example of a team that elected to deploy a president but no GM, as they currently do not have one in place.) The 57-year-old Wren’s front office experience dates back to the mid-1980s, and he’s worked with the Orioles in addition to the previously mentioned Expos, Marlins and Braves. Peter Abraham of the Boston Globe tweets that he finds it difficult to imagine any team owned by John Henry would completely abandon analytics, noting that there will have to be a balance in place. One can imagine that even in the event of a more traditional hire in the GM department, Dombrowski may bring in some new analysts or, at the very least, make an effort to retain some of Cherington’s more analytically inclined lieutenants. Of course, many that previously worked underneath Cherington may elect to seek employment elsewhere as well.